Depending on your quantities, specifications, artwork, and budget, we'll tell you your available and feasible options. We have a variety of print options to meet your project goals. Custom Screen Printing is our lowest minimum (for a lid print, 24 cans for most sizes; for a body print of cans greater than 4" in height, 96 cans in most cases). Simply explained, we take one of our solid color cans and put your single or multi-color spot logo or artwork on the lid or can (minimum can height for can body printing is 4”). It’s a great way to get your logo reproduced with a low minimum and without a lot of investment. 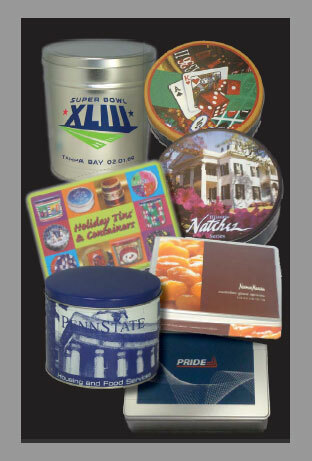 Custom Digital Printing is the newest (introduced in 2006) innovation in full-color can printing. Imagine a color copier meeting a tin lid. Available only on selected sizes and shapes, this technique allows for full-color, low minimums, and reasonable cost. Significantly lower set-up costs than lithography, however the quality isn't near that of lithography. There are limitations with this printing technique, and not all pieces of artwork will reproduce well with this method. Only select cookie/cake/candy sizes are available; popcorn cans can not be printed by this method. Full Color Custom Lithography is the standard for full-color cans. Nearly all of our stock design cans are produced in this manner. Custom Lithography requires plates and separations for each printed component (most full color jobs require 4 to 5 plates per component. Minimums generally run from 5,000 to 25,000 (for larger popcorn size cans, the minimum runs around 3,000) depending on the structure. Generally, the smaller the can, the higher the minimum. Each component surface, the lid cover and lid bottom, can body and inside, and end (bottom) underside and inside could technically be printed. The sizes and options are virtually limitless! Get started now... simply send your artwork (EPS or Adobe Illustrator is preferred for best print quality) to art@holidaytins.com along with the specific size, quantity, and specifications you desire.